Join us for a heartwarming comedy by Magic Theatre audience favorite John Kolvenbach (Mrs. Whitney, Goldfish). Anna will do anything to make her sister Lilly happy, including destroying all her relationships. When Lilly, Anna, and her husband Malcolm retreat to their late father’s cabin in Cape Cod, they expect to relax, unwind, and take stock. But when a charming but shadowy drifter enters the picture angling for Lilly’s heart, their pilgrimage takes a surprising turn. 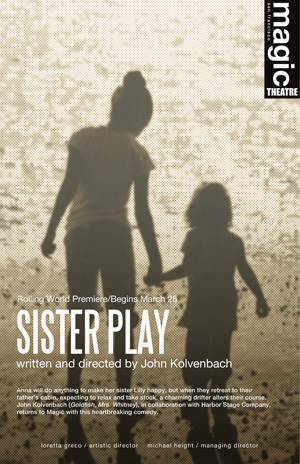 This production is presented as part of a Rolling World Premiere with Harbor Stage Company. 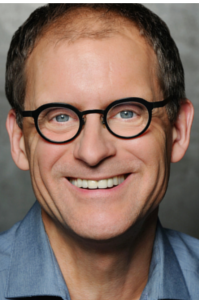 John Kolvenbach (Playwright/Director) is the author of Goldfish, Mrs. Whitney, Love Song, on an average day, Gizmo Love, Fabuloso, Bank Job and Marriage Play (or Half ‘n Half ‘n Half) which premiered in 2012 at Merrimack Repertory. Goldfish premiered at South Coast Repertory in the Spring of 2009, directed by Loretta Greco. Goldfish was then produced at the Magic Theatre in San Francisco in the Fall of that year. The Magic also premiered Mrs. Whitney in the Fall of 2009, under Kolvenbach’s direction. Love Song premiered at Steppenwolf in Chicago in the spring of 2006, directed by Austin Pendelton. Love Song went on to the West End, where it was nominated for an Olivier Award, best new comedy. The London production was directed by John Crowley, with Neve Campbell, Cillian Murphy, Kristen Johnston and Michael McKean. Love Song has been produced in New York, Zurich, Melbourne, Sydney, Wellington, Seoul and Rome. There have been over fifty productions in the US. on an average day premiered at the Comedy Theatre on the West End in 2002, with Woody Harrelson and Kyle MacLachlan, also directed by Mr. Crowley. Average Day has been produced in Tel Aviv, Buenos Aires, and Lisbon among many other places. Fabuloso premiered at the Wellfleet Harbor Actor’s Theatre in 2008, directed by Mr. Kolvenbach. Fabuloso was staged in San Juan and Zurich, in Spanish and Swiss German, respectively. Jessi Campbell* (Lilly) is very happy to be returning to the Magic once again. Jessi has worked in theater, film, and TV in NYC and San Francisco. She most recently played Beth in A Lie Of The Mind and Dee in And I And Silence at the Magic Theatre. Other favorite acting credits include: Blackbird (American Conservatory Theater), Speed-the-Plow (American Conservatory Theater), Inky (Women’s Project), Victoria Martin: Math Team Queen (Women’s Project), Commedia Dell Smartass (Ohio Theatre) and Lascivious Something (Cherry Lane Theater). She would like to give special thanks to Loretta and all the folks at Magic. What a season! She received her B.F.A. in Acting from The Theatre School at DePaul University. Member of AEA and SAG. 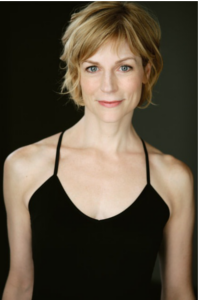 Lisa Brescia* (Anna) On Broadway, Lisa has appeared as Donna Sheridan in Mamma Mia!, Elphaba in Wicked, Cleo in Twyla Tharp’s The Times They Are A-Changin’, Amneris in Aida, and Marion Halcolmbe in The Woman in White. Additional New York credits include the role of Helena in All's Well That Ends Well at the Public Theater's Shakespeare Lab (Barry Edelstein, dir.) and Claire in Roundabout's Ordinary Days (Mark Bruni, dir. ; original cast recording). Regional credits include Hermione in The Winter’s Tale (The Shakespeare Theater of DC - ACA), Gertrude in Hamlet (Notre Dame Shakespeare Festival), Ivy in August: Osage County (Theater Raleigh), Sally in Cabaret (PlayMakers Rep), Kennedy Center's Broadway: Three Generations - Side Show (Violet), Chicago's Wicked (Elphaba), Into the Woods (Witch), The Unauthorized Autobiography of Samantha Brown (Mom), Evita (Eva), The Last 5 Years (Cathy), A Little Night Music (Petra), and Brigadoon (Meg). Training: MFA in Classical Acting from ACA; American Academy of Dramatic Arts. Proud member of AEA and SAGAFTRA. Thanks to John and everyone at Magic, and my husband, writer Craig Carnelia. Gillian Confair* (Stage Manager) is excited to return to Magic Theatre once again. Previous Magic credits include Every Five Minutes, pen/man/ship, and Bad Jews. Other local credits include Around the World in Eighty Days at Marin Theatre Company; Darling, Show Choir, and Homefront with the A.C.T. Young Conservatory; The Soldier’s Tale, a collaboration between A.C.T. M.F.A. Program and San Francisco Conservatory of Music; You, Nero (Production Assistant) with Berkeley Repertory Theatre; and Twelfth Night (Production Assistant) at California Shakespeare Theater. She is a proud alumna of Bryn Mawr College. Erik Flatmo** (Scenic Designer) previously designed the set for Bad Jews, Arlington and The Happy Ones at Magic. He has designed scenery for theatre and opera companies across the country, including A.C.T., Asolo Repertory Theatre (Florida), Berkeley Rep, Cal Shakes, San Jose Rep, South Coast Rep, Theatreworks and Yale Rep. His work in opera includes San Francisco Opera's Merola Program, San Jose Opera and Opera Santa Barbara. His work in dance involves collaborations with choreographers Joe Goode, Trajal Harrell, and Robert Moses. 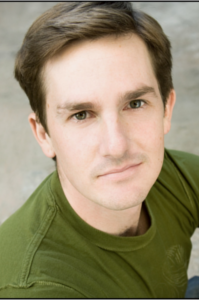 He holds an MFA from the Yale School of Drama and teaches set design at Stanford University. 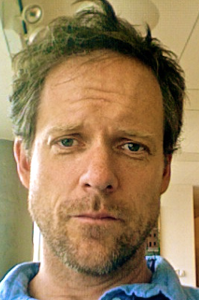 Jeff Rowlings (Lighting Designer) is a San Francisco based producer, production manager and designer. He was Production Manager for American Conservatory Theater (2001-2012), Production Manager and Resident Designer for Magic Theatre (1985-1995) and Producing Director for San Diego REP (1996-1998). Jeff co-founded Foghouse Productions which produced Culture Clash Anthology in San Francisco and Los Angeles. Foghouse produced the commercial world premiere of R. Buckminster Fuller: The History (and Mystery) of the Universe in San Francisco, Chicago and Seattle. Jeff produced the world premiere of Brenda Wong Aoki’s MU and produced and designed the world premiere of Liberty Bradford Mitchell’s The Pornographer’s Daughter. Most recently he designed lights for the World Premiere of Arlington at Magic and designed sets for the World Premiere musical, The Cable Car Nymphomaniac. Sara Huddleston (Sound Designer) joined Magic staff in March ’07. For Magic, selected designs include A Lie of the Mind, And I And Silence, pen/man/ship, Every Five Minutes, Hir, Arlington, Terminus, Se Llama Cristina, Any Given Day, What We’re Up Against, Or, The Brothers Size, An Accident, Mrs. Whitney, Goldfish, Mauritius, Evie’s Waltz, The K of D and Octopus (Magic/Encore Theatre Company). Further Bay Area sound design credits include In On It and T.I.C (Encore Theatre Company); The Shaker Chair (Encore Theatre Company/Shotgun Players); Macbeth (Shotgun Players); Three on a Party (Word for Word); A Round Heeled Woman (Z Space); Invasion! and 410 [Gone] (Crowded Fire). Ms. Huddleston received a B.F.A from the Carnegie Mellon School of Drama. Dori Jacob (Dramaturg) is a freelance producer, dramaturg and casting director and is thrilled to be in her 5th season working with Magic Theatre. At Magic, Ms. Jacob dramaturged the world premieres of Octavio Solis’ Se Llama Cristina, Linda McLean’s Every Five Minutes and Christina Anderson’s pen/man/ship. Further Bay Area dramaturgy/producing/casting credits include: Assassins (Shotgun Players), Marilee Talkington’s The Creative Process (SOMArts), Laura Schellhardt's The Comparables & Elizabeth Hersh’s Shelter In Place (Playwrights Foundation). As the resident producer for Magic’s developmental programming, Ms. Jacob’s credits include: 2011, 2012, 2013, 2014 & 2015 Virgin Play Series, the 2012 Asian Explosion Reading Series and the 2013 Costume Shop Festival. 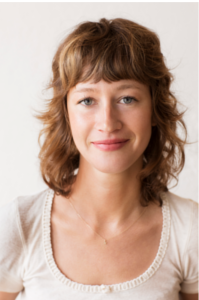 Ms. Jacob is a graduate of UC Santa Cruz and NYU’s Tisch School of the Arts.